Russia is hated, the markets are down. Russia have very little debt, huge natural resources and they're opening up more and more. So, I would suspect in a few years we'll look back and say, "Oh remember when Russia was so cheap? Why didn't we buy it?" It is still illegal (to invest in North Korea). I would rather be poor and out of jail than rich and in jail. As soon as it is legal I will start making progress. Well, I will probably have to invest in South Korean stocks first. I own Korean Airlines because for instance, there will be a lot more travel when it becomes legal and open. At the moment there is no stock market in North Korea. They need everything. They need electricity, they need soap, they need table cloths. If you have any kind of expertise you can make a fortune in North Korea. They are where China was in 1981. "Today Jim Rogers’-led Ocean Capital Advisors, in partnership with ETF Managers Group, rolled out an ETF that invests primarily in other ETFs using a methodology driven by artificial intelligence. The Rogers AI Global Macro ETF (BIKR) mainly holds a portfolio of single-country ETFs, though it can incorporate a short-term Treasury ETF when needed. The fund comes with a total expense ratio of 1.18%, which includes 43 basis points in acquired fund fees, and lists on the NYSE Arca. The fund’s underlying index targets single-country ETFs with the broadest exposure available. Its portfolio is determined by an AI-driven algorithm that incorporates macroeconomic data in order to project market movements over an 18-month period, although the algorithm also seeks to identify shorter-term micro-cycles, which can affect the fund’s allocations. The algorithm looks at the data on a monthly basis, according to the prospectus." It is still illegal (to invest in North Korea). I would rather be poor and out of jail than rich and in jail. As soon as it is legal I will start making progress. Well, I will probably have to invest in South Korean stocks first. I own Korean Airlines because for instance, there will be a lot more travel when it becomes legal and open. At the moment there is no stock market in North Korea. They need everything. They need electricity, they need soap, they need table cloths. If you have any kind of expertise you can make a fortune in North Korea. They are where China was in 1981. I would suspect in a few years we'll look back and say "Oh, remember when the russian stock market was so cheap, why didn't we buy it?" No one has ever won a trade war. Trade wars always end badly and Mr. Trump and the people around him seem to be very keen on trade wars. Mr. Trump has talked about them for years. Or he doesn't know history which is possible or he thinks he's smarter than history which is probable. He thinks that he can win a trade war no matter what and therefore he's willing to try and it's getting worse and worse. Agriculture is very depressed right now it's not working at the moment but agriculture is certainly a good place to for me to put money. In 2008 we had a big problem because of too much debt. Since 2008 the debt everywhere has skyrocketed. Many people have talked about austerity but nobody has done any austerity. The debt everywhere it's much, much higher than it was then. The America's central bank balance sheet alone has gone up 500 percent in those eight or ten years. Bitcoin: Is It a Currency? No one has ever won a trade war. They always end badly and Mr. Trump and the people around him seem to be very keen on trade wars. I am still buying shares in China, Russia, Japan and some parts of the world if I find something good. The US stock market is at an all-time high and I don't particularly like buying things at all-time highs. "I have not yet found a way to invest in a public company a way to invest in blockchain." "Bitcoin: Is It a Currency?" Peter Schiff: "Precious Metals: A Spike In Silver?" Peter Schiff: "The Fed Will Not Save The Stock Market Again"
I'm not as convinced about cyber currencies in the future. I know that all of you are smarter than every government in the world smarter than every politician in the world but having said that...I'm of the view that most of them will not fit succeed and maybe all of them will disappear. And the reason I say that, the main reason I say that is because governments don't like losing control. You're smarter than every government in the world but they have the guns whether we like it or not and if the government's come down and say OK guys this party is over? Peter Schiff: "Banks: Deutsche Bank (DB) Could Be The Weak Link Of A Chain"
I did not learn anything from Soros, except that I am not a great trader. Whatever success I have had has come from finding things that are cheap where fundamental change is taking place and buying. Most people know the trade wars have never worked. Nobody wins a trade war, everybody knows that. China and the US are the largest economies in the world. They're both vibrant, dynamic economies. They could work together and really be very, very rich. They're two very important and rich countries. If they work together instead of fighting each other over foolish things can you imagine the two countries working together how exciting and prosperous both would be? If you get out of map and look at the states that Mr. Trump won they all produce agriculture and they all produce energy. 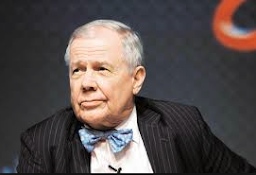 Jim Rogers talks about trade wars and financial market at the St. Petersburg International Economic Forum.